Marietta, GA – Opportunity Knocks for Youth (OK4Youth) mentor Sam Smith earned the AJC Heart in Hand Volunteer of the Year award at the 24th Annual United Way Heart in Hand Volunteer Recognition Award Program. The April event at the Marietta Conference Center honored some 30 volunteers, nominated for their service to the community. As an OK4Youth volunteer, Smith has mentored four at-risk youth over the past five years. One of his mentees, Deontae Lyons, went from a struggling foster teen in high school to a June 2009 graduate of Chattahoochee Technical College. 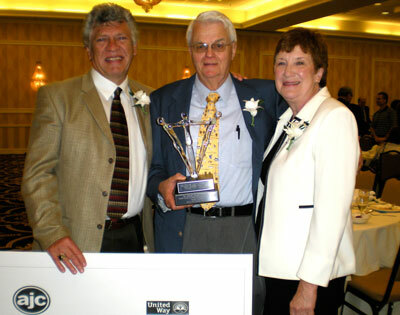 At an emotional end-of-year ceremony, Lyons presented Smith with the 2008 Opportunity Knocks for Youth Volunteer of the Year Award in December. With Smith’s support, another of his mentees will graduate from high school this year. Mentoring requires a commitment on emotional, mental, and physical levels. It involves weekly contact, time together and many hours of phone conversation. Smith develops relationships with his mentees that include fishing, golfing, museum outings, workshops, sporting events and much conversation about goals. As an OK for Youth mentor, board member and the organization’s treasurer, Smith also finds time to volunteer in other areas including the Samaritan House of Atlanta and Mt. Bethel United Methodist Church leading men’s groups, helping in the Older Adult Center and as a Community Service Day group captain.